The visitor center at White Sands National Monument was closing. It was 7 p.m. The evening's entertainment was about to begin. Everyone headed to their cars and caravanned through the gates to an entrance station, where a sign warned that there was no water past that point. I instinctively touched my thermos filled with cold water and then checked the floor behind the driver's seat to verify our backup supply. Once past the entrance, visitors dispersed. Some seemed to know where they were going, and what they were doing, as if White Sands was part of their weekly routine. As newcomers, our plan was to travel the eight-mile scenic drive into the heart of the dunes, stopping at wayside exhibits to gather information and at pullouts to hike and take photographs. As newcomers we were awestruck, lost for words, almost reverential. We were at the northern end of the Chihuahuan Desert, encircled by mountains in the Tularosa Basin. White gypsum sand formed endless dunes that reflected the evening light. Everything glistened. We stopped at a pullout, leashed our dog, Willie, and went for a hike. The gypsum was soft and fine. The environment was harsh and hazardous and strangely inviting. The dunes are constantly moving, pushed along by southwest winds. They rise and fall and continue to advance as much as 30 feet a year. The sand covers everything in its path. 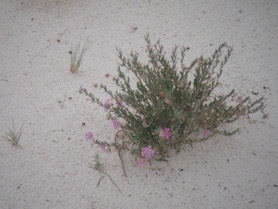 And yet there is adaptation — flowering plants and varieties of cacti that have managed to avoid being buried by the moving dunes. It was easy to get lost. My husband, camera in hand, headed in one direction. The dog and I headed in another. Finding myself in a valley, surrounded by dunes that towered over my head, I looked at the sky and wondered how man became so detached from the natural world. I thought about Hassanein Bey, who in the early 1920s traveled by camel caravan thousands of miles across the Libyan Desert to find two rumored oases. By day, the Bedouin guide used his shadow as a compass. By night, the stars led the way. I thought about "the hand of man," those encouraging signs Bey found in the desert that showed another caravan had passed that way. I looked at the ground. Luckily, there was no wind to cover our tracks. The dog and I followed our footprints out of the valley. Back in the car, we passed groups of people who had pulled off the road and were sledding down the dunes on plastic snow saucers. We drove through a picnic area filled with folks enjoying their evening meals. 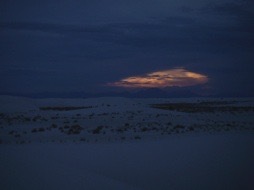 We saw photographers setting up camera equipment along the dunes' crests to capture the evening's images. By sunset, most of us had gathered at a natural amphitheater at the end of Dunes Drive for the evening program. Author Michael Welsh kept us entertained with his history of White Sands National Monument. As night replaced day, we waited and watched. An eerie glow preceded a fiery orange full moon that inched its way over the horizon. Men standing atop a nearby dune began singing in Spanish. The sound was hauntingly beautiful. The moon — its performance short but oh, so sweet — slipped behind a bank of clouds. We stood transfixed. 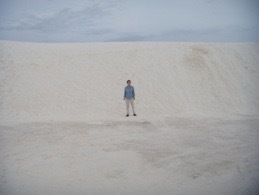 In his presentation, Welsh mentioned that he had been coming to White Sands since he was a young child. He talked as if there was something about the dunes, something compelling. I can't explain it either, but the next day we changed our travel plans and returned to White Sands.